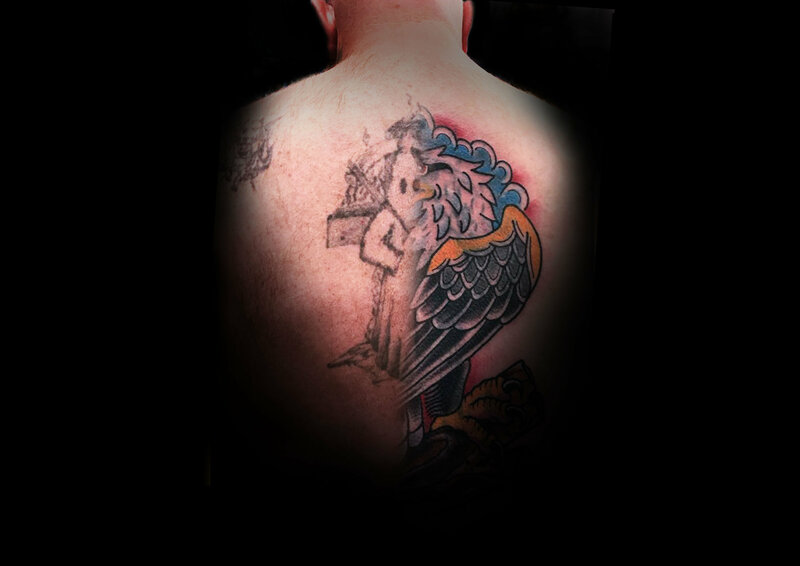 In Ohio, tattoo artist Billy Joe White has offered to cover up swastikas, Nazi images, and other hate-filled ink for free in an attempt to "erase the hate"
It’s not uncommon to regret an old tattoo – for yesterday’s symbol of coolness to become today’s source of embarrassment. But what if the ink reveals more about you than just having questionable taste? What if it draws a permanent picture of hatred and racism? Directed by Cy Dodson, Beneath the Ink is a timely documentary which tells heartfelt stories of redemption and insists that some mistakes can indeed be erased. Or in this case covered up… The 12 min short is a true feel-good piece, which will touch even the most cynical of hearts (mine included) by inspiring action for positive change. Beneath the Ink follows Ohio tattoo artist Billy Joe White, who covers up tattoos free of charge. To qualify, however, your skin art has to be of a very particular type. Swastikas and KKK inspired symbols all meet the criteria, as do any racist-themed tats. As a result, Red Rose Tattoo Studio is a busy place, often frequented by former neo-Nazis and reformed skinheads, some of whom we get to meet and hear their stories. Dodson first read about Billy Joe White in an article, which described the tattoo artist’s unique line of work and explained that he was encouraging people in his community to ‘bring their mistakes’. “I grew up in Zanesville, Ohio where this was filmed. It was a great place to be a kid, but there was an undeniable underbelly of racism that existed. When I read the article from my hometown paper, my immediate thought was this is someone using what talents and tools are available to make a difference. Billy and his staff at Red Rose Tattoo are making a huge impact on the people in the film and many others that they’ve touched with their ink and needles.” – the director shared. I have to admit that watching Beneath the Ink, I felt a little bit unsure about the work Billy and his colleagues were doing. I couldn’t help but wonder, how could he know if the people walking through his studio doors were truly remorseful? What if they still harboured hateful, poisonous beliefs, but didn’t want to, quite literally, wear their hearts on their sleeves? And even if they were telling the truth, did they deserve to be forgiven and for their past to be covered up? Then, about halfway through the film, a burly, scary looking bloke with a huge burning cross on his back entered the Red Rose Tattoo Studio. Without giving anything away, in case you haven’t watched it yet, this man’s story put my doubts to rest. I realised those were coming from my own prejudice I have against racists, homophobes and all people who are driven by hate. I was judging White’s customers purely on the little that I knew about their past, and it was wrong. For me, Beneath the Ink is about forgiveness and second chances. It is also about making a difference. As Dodson put it; “not many people step up in today’s world and the end result is an abyss of dismal clutter and even more wasted time with absolutely nothing accomplished. I wanted to make this film to show we all can use our abilities to make a difference in this world, even at a little tattoo shop on Maple Ave in the town I grew up”. The director is currently working on his next film on the homeless crisis in the suburbs of Twin Cities. We’ll keep an eye out for it, so stay tuned!